(LOUISVILLE) - Michigan's start to the NCAA Tournament was more thorough than coach Kim Barnes Arico expected. Which is saying something for someone who has yet to lose an opener. 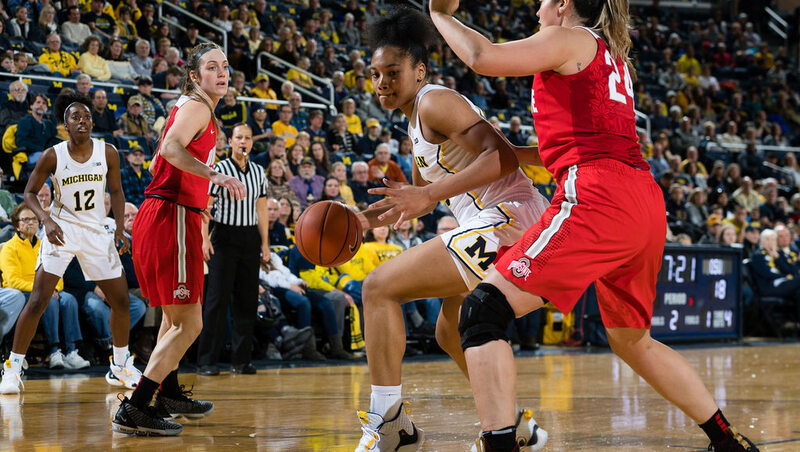 Naz Hillmon scored 17 points off the bench, Nicole Munger and Kayla Robbins each added 13 and the eighth-seeded Wolverines shot a season-high 56 percent to run away from No. 9 seed Kansas State 84-54 on Friday. Michigan's 17-5 surge over 5:10 in the second quarter provided a 43-28 halftime lead that expanded to as many as 37 late in the fourth. The Wolverines (22-11) owned rebounding 50-19 and paint scoring 52-26 while holding the Wildcats (21-12) to 36 percent shooting. Michigan's bench also outscored K-State 38-9. Munger and Robbins combined to make 11 of 18 shots while Deja Church added 12 points and a team-high seven assists. Michigan shot well and hit 16 of 26 after halftime on the way to winning its 10th in 12 contests. Christianna Carr had 21 points and Rachel Ranke 11 for Kansas State, which committed 17 turnovers leading to 26 Michigan points. The Wildcats' rebounding total marked a season low. Michigan will face top-seeded Louisville in Sunday's second round. The Cardinals routed No. 16 seed Robert Morris 69-34 in the first game.